Open the revolving doors on the terminal, and welcome to the busy, bustling LEGO City Airport! Check in at the ticket desk, go through the security checkpoint with X-ray machine, and relax in the café and lounge while you wait for the call to board your flight. Once the go-ahead comes through from the Control Tower, you’re all cleared for take-off, and it’s off on another adventure! 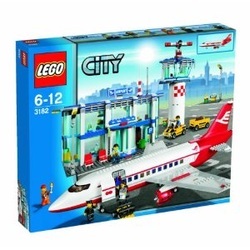 Your Lego City Airport (3182) includes jet plane, flight terminal, control tower, baggage cart, plus 5 minifigures: passenger, pilot, flight attendant, steward and service man. Terminal measures over 10" (25cm) long and over 10" (25cm) tall. Airplane measures over 20" (50cm) long and over 7" (17cm) tall. Like this top Christmas toy, but not quite right? How about a Fireman Sam Deluxe Fire Station instead?